Welcome to the TiLAR Wiki. TiLAR stands for Therapist in the Loop Assistive Robotics. It is the working name for our efforts to use robots to help children with social learning disabilities. 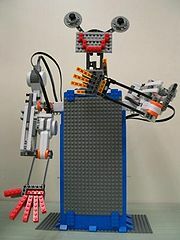 The hypothesis behind this proposal is that children with ASD and SLI can benefit from interacting with a robot that: 1) occupies the same physical space as the child, 2) can move to increase engagement, and 3) can dynamically express social cues that may be ambiguous using only verbal stories and pictures. There is mounting evidence in the field of human-robot interaction that robots induce strong social responses in people. This social response is being studied by researchers as a potential intervention for helping children with autism become more sensitive and better able to respond to social cues. The social response induced by robots is thus a potential tool for helping both typical children and children with disabilities. Many current research efforts are seeking to build fully autonomous robots to fill such roles, but the responsiveness of such robots is typically limited to simple algorithmic responses. We hypothesize that including a therapist or teacher “in the loop” to choreograph the interactions that take place will allow the robot to better support imitation-based therapies for children with learning disabilities. 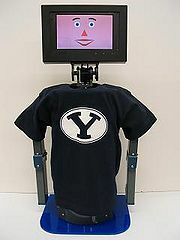 Developing technologies to test this hypothesis is possible by uniting three prior research threads: Honda’s autonomous imitation capabilities, BYU’s clinical experience in understanding, diagnosing, and providing therapies for children with SLI and ASD, and BYU’s experience in developing user interfaces and robotic technologies to support effective human-robot interaction. This work is sponsored by a 2008 BYU Mentored Environment Grant and a 2008 Honda Initiation Grant. Past Meetings — Follow this link to read past meetings notes. Investigate how robots can assist therapist in treating children with autism in clinical settings. Identify traits of the robots (form, shape, functions, etc.) that affect autistic children's behaviors. Design and develop human-robot interfaces that enable the therapists to choreograph (“program”) a robot's behaviors. Evaluate interaction techniques that improves the human-robot interaction. This wiki site requires login and is used to post things not open to the general public. We can post things such as internal reports, discussions of cases, and project repository access information here. Secure TiLAR Wiki. A beautiful story about a girl with autism. Behzad using retargeting with Asimo at IROS. Robot Kinect Hacks from IEEE Spectrum. A nice summary of work done with KASPAR. Note the allusions to generalization – pretty cool. Babies treat robots as intentional beings.